Director – Phil Joanou, Screenplay – Robert Ben Garant, Producers – Jason Blum & Robert Ben Garant, Photography – Steeven Petitteville, Music – Nathan Whitehead, Visual Effects – VFX Legion (Supervisor – James David Hattin), Special Effects Supervisor – Chris Nelson, Makeup Effects – J. Alan Scott, Production Design – Lauryn Leclere. Production Company – Blumhouse/Third Baptist Holding Corp. In 1985 in California, forty-seven members of the Heaven’s Veil religious cult drank poison and committed mass suicide at the urging of leader Jim Jacobs. The sole survivor was a child, Sarah Hope. Twenty-five years later, the now adult Sarah is persuaded by a documentary crew led by Maggie Price to revisit the Heaven’s Veil site. After setting up camp in the abandoned grounds, they discover a series of videotapes made back in 1985 that show Jacobs conducting a series of experiments in taking a fatal poison and then reviving from the dead. As things start happening around the site, it appears that the spirits of the dead still inhabit the area. The Veil is a horror film from Phil Joanou. Joanou is an interesting name who began directing with the obscure high school drama Three O’Clock High (1987) but gained attention with his music videos for the rock mega-group U2, starting from the point of their album The Joshua Tree (1987). Joanou made the cinematically released U2: Rattle and Hum (1988), a chronicle of the making of the group’s album of the same name and accompanying US tour, which is one of the best ever rock concert films. As a result of this, Joanou was granted a series of feature film projects – the Irish mobster film State of Grace (1990), the psycho-analysis thriller Final Analysis (1992) and Heaven’s Prisoners (1996) – none of which were runaway box-office successes. He dropped out of Hollywood after expressing dissatisfaction with the studio system and made the independent quasi-autobiographical Entropy (1999), which does contain some fantastic elements, and returned with the prison/sports film Gridiron Gang (2006). Joanou’s track record is uneven but filled with promise. I expected him to do great things when it came to the horror genre. 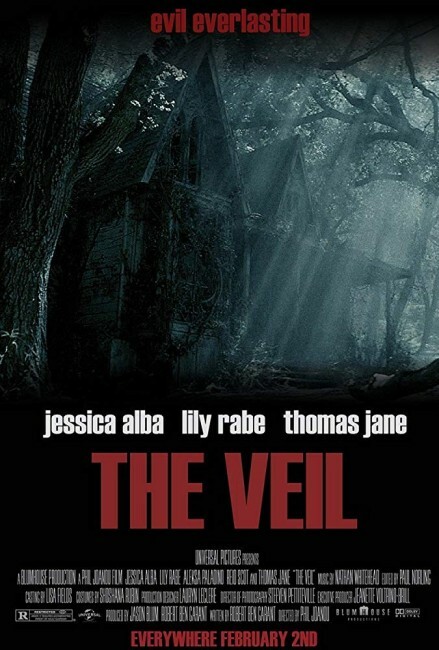 For The Veil, he has teamed up to make the film for Jason Blum’s Blumhouse production company, which has become a near-ubiquitous presence in horror since around 2010. Blum specialises in horror films made for under $5 million and has had great success with the likes of Paranormal Activity (2007), Insidious (2010) and The Purge (2013), all of which have produced multiple sequels, plus a great many other titles. (See below for Blumhouse’s other productions). The other producing partner is an eyebrow-raising company called Third Baptist Holding Corp. I ended up heavily disappointed with The Veil though. Notedly, it was one film that Blumhouse chose not to release theatrically and let slip out into an unnoticed dvd release. The problem is that The Veil is just not a very interesting film. Phil Joanou seems to have failed to have spent much time studying horror films and neglects to place anything into the build-up – nearly half the film is spent with the documentary crew pottering around the site uncovering the tapes and arguing over whether they should do anything or leave. It is not the stuff that engrossing horror cinema is made from. And then we come to the actual horror elements. The set-up of the lone survivor revisiting/haunted by the dead members of a cult reminds of the mostly forgotten 1980s horror film Bad Dreams (1988). Cults have become a stock staple of the horror genre but nobody has truly made a film about a Manson or Jim Jones-styled cult into something scary so far. There was Ti West’s recent Jonestown-modelled The Sacrament (2013) but I question whether that was even a horror film. The latter half of The Veil offers numerous scenes with the souls of the dead cult members possessing the living, which is not nearly as interesting as it sounds, all interspersed with screening of the videotapes and a series of quasi-Found Footage flashback scenes showing Thomas Jane leading the cult members on an experimental journey into the afterlife followed by their resurrection – shades of Flatliners (1990). This leads to a tragic twist ending that fails to really work. Top-lined in the film is Jessica Alba who remains, as always, forgettable. The show is taken from under her by Lily Rabe who has proven herself an actress of not inconsiderable worth on tv’s American Horror Story (2011– ) and here gives a strong and worthwhile performance as the brittle and damaged survivor confronting her past. 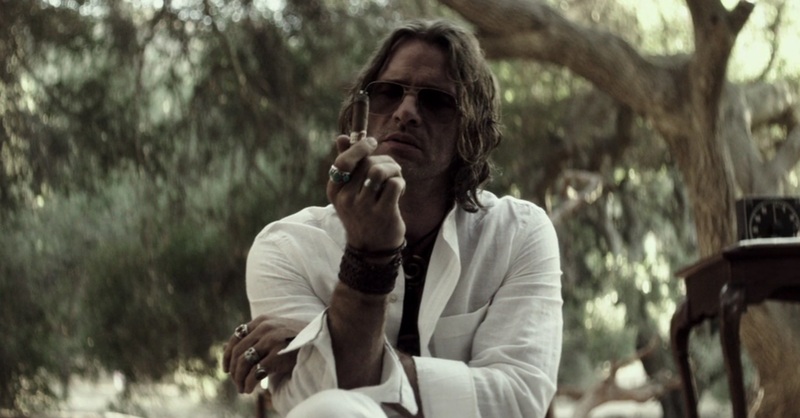 The cult leader is played by Thomas Jane behind a set of dark glasses clearly intended to evoke Jim Jones. Jane’s would-be theatrics in trying to suggest he is a charismatic figure result in an extremely silly performance. Jason Blum and his Blumhouse production company have produced a number of other genre films including:- Hamlet (2000), Paranormal Activity (2007) and sequels, Insidious (2010) and sequels, Tooth Fairy (2010), The Bay (2012), The Lords of Salem (2012), The River (tv series, 2012), Sinister (2012) and sequel, Dark Skies (2013), Oculus (2013), The Purge (2013) and sequels, the tv mini-series Ascension (2014), Creep (2014), Jessabelle (2014), Mercy (2014), Mockingbird (2014), Not Safe for Work (2014), Ouija (2014) and sequel, 13 Sins (2014), The Town That Dreaded Sundown (2014), Unfriended/Cybernatural (2014), Area 51 (2015), The Boy Next Door (2015), Curve (2015), The Gallows (2015), The Gift (2015), Jem and the Holograms (2015), The Lazarus Effect (2015), Martyrs (2015), Visions (2015), The Visit (2015), The Darkness (2016), Incarnate (2016), Viral (2016), Amityville: The Awakening (2017), Get Out (2017), Happy Death Day (2017), The Keeping Hours (2017), Split (2017), Stephanie (2017), Bloodline (2018), Cam (2018), Delirium (2018), Halloween (2018), Seven in Heaven (2018), Truth or Dare (2018), Upgrade (2018), Ma (2019), Relive (2019) and Sweetheart (2019).